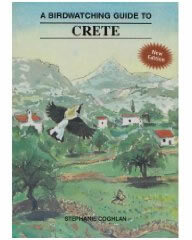 Crete Bird Reports were published by the late Stephanie Coghlan (1943-2017) from 1986 to 2005. Until this web page was created (April 2010, last reports added in November 2012), these had not been on the internet. Honeyguide set up this online archive as a service to birdwatchers who may be visiting Crete, and to make the information public for conservationists on the island or elsewhere. Click on the links below to see the Crete Bird Reports. The reports are in PDF format which requires a plug-in to enable you to download and print the reports. You can download the plug-in from here. Stephanie started the Crete Bird Report as she was well-placed to gather bird records from British birdwatchers and groups visiting the island. These records have proved valuable for Crete-based ornithologists, based at the university in Heraklion, who now lead on bird recording for the island. The early reports were unchecked records but recorders were asked to send an 'Unusual Bird Form' to the Recorder for Greece, George Handrinos. In Dec 2004 a Greek Birds Committee was set up and in 2006 the website www.ornithologiki.gr. From this site an Unusual Bird Recording Form can be downloaded as well as a gallery of bird photographs checked. Stephanie Coghlan used to run Snail’s Pace Wildlife Holidays. She was the author of A Birdwatching Guide to Crete, the only ‘where to watch’ guide to Crete, with useful background information and checklists of birds, butterflies, reptiles & amphibians and mammals. It is currently out of print. 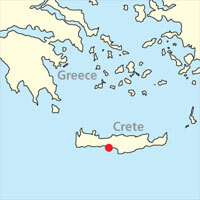 Honeyguide has run at least one holiday on Crete every April since 1995, except 2010 due to volcanic ash. Our reports from 2003 to the present are here.